← Coffee, African Tea, or Fanta? Eighty-five percent of all churches in America average less than 200 in worship attendance. Some people love being in a really big room for really big church services. The size of the crowd inspires and encourages them. When they worship Jesus, they see that they are a part of something far bigger than themselves. The crowd helps draw them into a deeper place of faith. And that’s great. I served on staff in a large church with a high level of structure for ten years. I learned much about developing an equipping culture as I read voraciously and attended workshops, seminars and conferences. Most of it was really great stuff and I will always be grateful for the opportunities I had through the support and encouragement of that church. But that experience has also been a stumbling block for me. My thoughts, habits, and practices regarding equipping people for ministry were developed in the context of the large church. However, I have been serving in a small church these past five years, and I’ve found that most of what I learned about structure and organizational practices just doesn’t fit here. By far, most of the resources available are written and presented for the moderate to large church, not for small congregations. 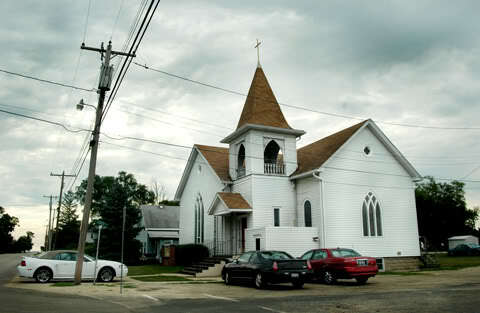 I find this very interesting since small churches greatly outnumber big churches! Where are the equipping resources that pertain to the congregation of 100 or less? Perhaps there are so few resources available because the answer for the small church is so simple: relationships. If you serve a small church you don’t need all those structures and processes that are necessary in a larger church. What you need to do is come alongside folks. You need to meet with them, get to know them, invest in them. Help them discover how God has wired them for ministry, then help them find a place to live it out. (That may be in the church, but more likely it will be outside the church–more about that in a future post.) In many ways, this is much easier than the practices I employed in the larger church–less administrative detail to attend to, fewer systems to continually evaluate and tweak, fewer cracks for people to slip through. Letting go of the large-church mentality proved to be a bigger challenge than I anticipated. However, I think it’s making me a better pastor, a better leader…a better equipper. This entry was posted in Equipping, Leadership and tagged equipping, equipping leader, leadership, ministry, small church, vocation. Bookmark the permalink. There is a lot of filtering that needs to happen with any resource, and even more with the equipping stuff we learned. But I think equipping is especially natural and effective and ESSENTIAL in a 200 and less congregation! Bless you for working through and re-learning equipping ministries and sharing it! Thank you for your encouragement, Rachel!